Pacific White Sided Dolphins are charming and energetic dolphins with playful spirit. They are distinguished by the bold colors of black, white and grey. Pacific White Sided Dolphin was named by mammalogist and a librarian of the Smithsonian Institute, Theodore Nicholas Gill, in the year 1865. The Pacific White Sided Dolphin derives its name Lagenorhynchus obliquidens from a Greek word “Lagenos” which means “bottle” and “rhynchus”, meaning “snout”. The word “obliquidens” is derived from a Latin word “obliquus” which means slanting teeth. 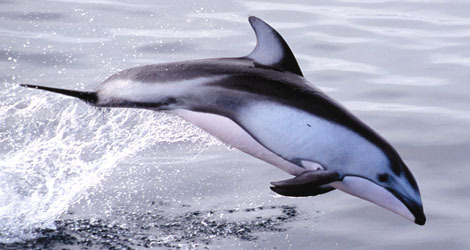 Morphology of the Pacific White Sided Dolphin is similar to the Dusky Dolphin. Pacific White Sided Dolphin has short and a well defined beak. Each jaw consists of 21-28 pairs of small and cone-shaped teeth. They have a conical shaped head. 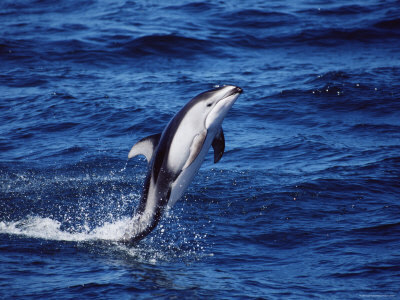 The pacific white sided dolphin has an attractive body pattern. They have a cream belly, chin and throat. They are black on the top, their sides, flippers and dorsal fins are grey with a white belly. The average size of a male dolphin would be 2.5 meters and females would be 2.3 meters in length. On an average, an adult female weights around 85-150 kilograms and males 100-200kgs. The dorsal fin of the Pacific White Sided Dolphins is tall and sharp. The posterior portion of the fin is grey and the leading edge is black. Pacific White Sided Dolphins are social animal. They usually form a school of 5 to 100s of them, including all ages, gender and even other species. While swimming, they stay close and swim in a line. While feeding too they divide themselves in a sub-group of 10-20 individuals. Gregarious and athletic, they are aerobatic swimmers. They can leap and perform somersaults in the air and are always in a playful spirit. They use echolocation to find their prey by sending high frequency sound across. Those click rebounds and the dolphin picks up those frequencies enabling them to detect the object’s distance, shape and size. Pacific White Sided Dolphins are found in the cool and temperate waters of the North Pacific region. They range from Bering Sea to Southern Japan in Western Pacific Ocean and Gulf of Alaska to Gulf of California in Eastern Pacific Ocean. They follow migratory pattern hence are found in California shore during winters and migrate towards north in Oregon, Washington during summer. Pacific White Sided Dolphins are abundant at latitude of 38 degree north to 47 degree north. Pacific White Sided Dolphins are carnivores and mainly feed on pacific sardines, herrings, rockfish, sablefish, smelt, capelin, squids, Pollock, hake, salmon, cod, shrimp, pacific saury and small fishes. A female pacific white sided dolphin has an age span of 46 years and that of a male is 42 years. Females become sexually mature at the age of 7-11 years and the males at the age of 9-12 years. The calving season starts from May till September. The gestation period is about 11-12 months. The female takes care of the calves for 8-10 months. They reproduce once in every 4 to 5 years. Killer Whales and sharks are the major predators of Pacific White Sided Dolphins. Dolphins were considered as fish by the Greek philosophers until 1758, when it was classified as a mammal. Dolphins unlike fishes breathe through lungs. They are warm blooded mammals and their young calves are fed with milk after birth. They are attractively marked with striking black and white coloring. They are very social and playful spirited animal. Pacific White Sided Dolphins have high intelligence, sharp memory, very social behavior and can learn primary symbol codes. Studies have also proved that they have the ability of self-recognition. 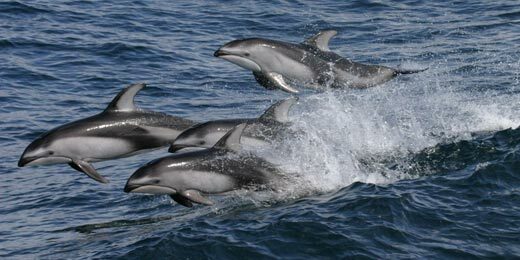 They travel in a school of 5-100 individuals and also associate with other species of dolphins, sea lions and seals. The population of Pacific White Sided Dolphin is estimated to be approximately 900,000. Pacific White Sided Dolphins were the first of its kind to be studied and drafted by US navy. Pacific White Sided Dolphin prefers off-shore deep water hence are seen following a migratory pattern. They migrate to the California shores during winter and further north towards Oregon, Washington during summer. They adapt well in captivity and have not been reported to be aggressive at all. North America and Japan has almost 50 of them in dolphinariums. It is illegal to hunt down pacific white sided dolphins however it is legal in Japan. At times they are harmed by incidental catch in gillnets and trawls. They are sometimes harmed by harpooning in Japan. 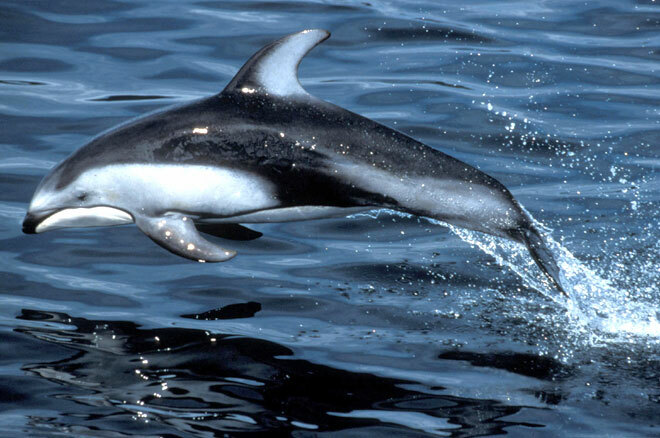 Pacific White Sided Dolphin is listed as a least concern species. The International Union for Conservation of Nature and Natural Resource Red List has listed Pacific White Sided Dolphin as “Low Risk Least Concern” animal.